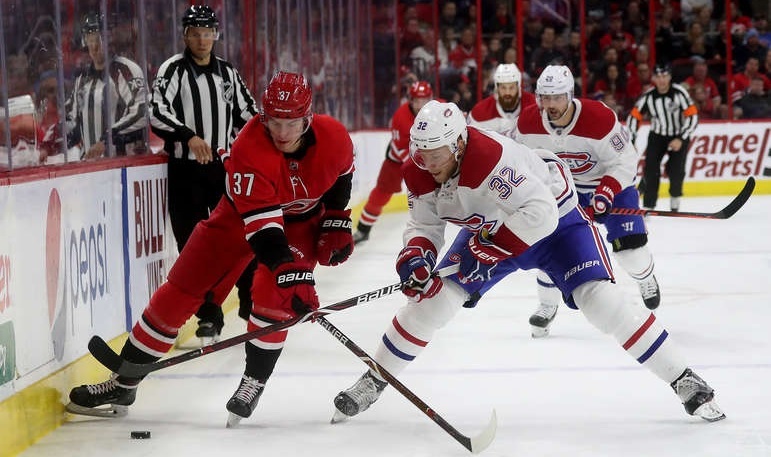 As the Habs renewed with the Bell Centre faithful on Wednesday night, the challenge before them was much bigger and more experienced than the Detroit Red Wings they faced Monday night. In the St. Louis Blues, the Canadiens were facing a foe that looked much more like the Los Angeles Kings who dictated play in their matchup last week. 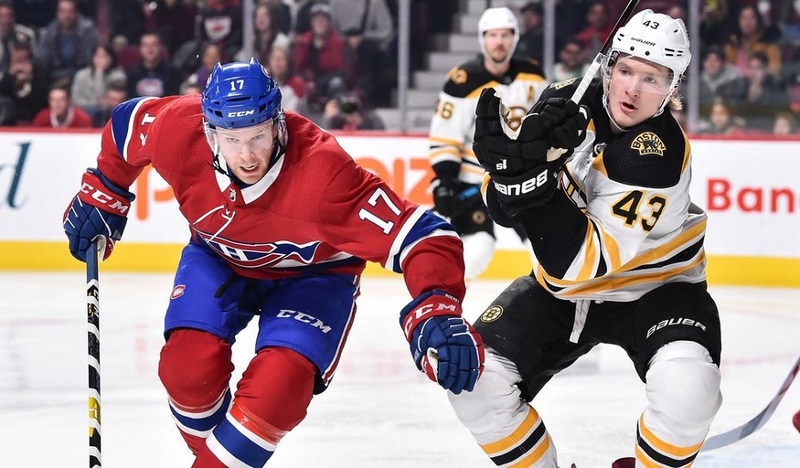 The test was an important one for the Habs and for this test, two lineup changes were to be felt. Carey Price finally returned to his crease after two good games for Antti Niemi. On the blueline, Victor Mete (who was dealing with a hand issue) was in the press box meaning that Karl Alzner got to make his season debut. The forward lines remained intact. The Habs once again showed some resiliency and toughness in escaping with another W to start the season. This latest 3-2 triumph came with the contributions from the top trio and some timely saves by Price. Before the on-ice festivities got underway, the Canadiens organization delivered one of their vintage pregame ceremonies to honour the 1,000 games played by Tomas Plekanec. As the action turned to the ice, the Habs wasted little time in making sure that this game would not resemble last week’s contest against the Kings as a superb breakout by Mike Reilly and Artturi Lehkonen sent Max Domi and Jonathan Drouin off on a 2-on-1. With back pressure imminent, Domi opted for the shot which bested Jake Allen for a goal before the end of the first minute. In the next minute, Jordie Benn decided to accept an invitation by Pat Maroon to drop the gloves, holding his own despite a significant size disadvantage. As the Blues were clearly trying to use their size advantage to intimidate the Habs, it was Noah Juulsen who got the best lick in when he rocked Jaden Schwartz. Despite the numerous hits all over both zones, play remained to the perimeter in all zones as very little was going on in terms of scoring chances. After the big hit, Juulsen was guilty of a few giveaways in the defensive zone and the second such occurrence resulted in the first penalty of the night as Brendan Gallagher taking a slashing penalty with the shift in the defensive zone getting extended. 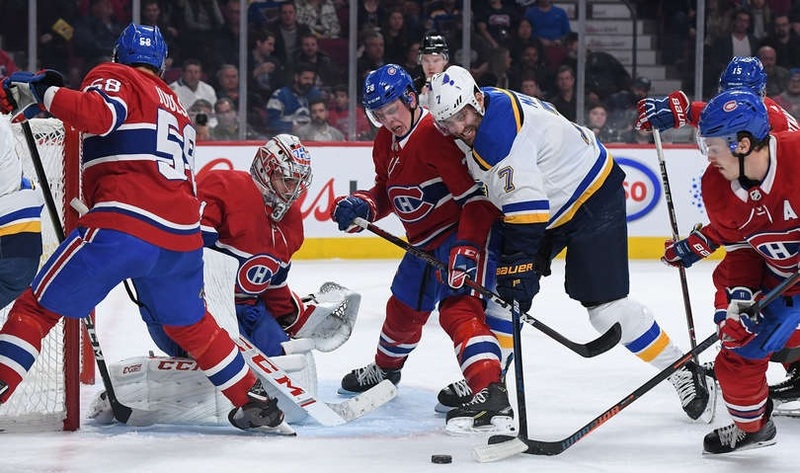 Price was forced to make a solid save on Maroon in the opening moments of the man advantage, but it was all the blues could muster with their opportunity. Alex Steen was then sent off for interference as Jesperi Kotkaniemi took advantage Steen’s stick to draw a rather soft penalty. The Habs power play looked about as dangerous as the Blues, so the period ended with the 1-0 Montreal lead. The Habs had another positive start to the second as Reilly was tripped 20 seconds into the period to send the Habs to the power play. This second man advantage was even more disorganized than the first, so much so that Charles Hudon was called for interference with 20 seconds to go in the penalty. This time, the Blues made it count as a point shot from Vince Dunn found its way through a crowd of bodies to beat Price. After the goal, the Blues controlled play for almost four minutes until a full-effort shift by the Tatar-Danault-Gallagher line got the Habs going. This shift really trapped the Blues, who ended up with a hooking infraction. The Habs third man advantage of the game saw a confused play between Reilly and Charles Hudon turn into a nice fake by Reilly which opened the ice for him to put one home over Allen’s glove to restore the lead. The goal sparked the Blues who fought back with determination to try to even the score once again before the end of the period. Price was forced to make a few good saves on lateral passes that should never be allowed to get through a team’s defensive zone. Over the last five minutes of the period, both teams exchanged posts and took turns really applying the pressure on the opposition D, without really threatening the net of the netminders too much. With 3:42 left, the Habs got a chance to extend their lead when Maroon took an undisciplined penalty when he used his free hand to spin around Kotkaniemi away from the play. Unfortunately, the Habs were unable to win the puck battles that would allow some offensive production from the power play unit, and so the second period ended with the Habs still ahead by one. The opening three minutes of the third saw both teams exchange some good offensive zone time forechecking the opposition into errors. At the three-minute mark, Joel Armia took a bad penalty in the offensive zone to send the Blues to a power play. This time, their man advantage looked dangerous and forced Price to make a few more big saves. The Blues controlled most of the middle of the period, except for a few shifts by the Domi line that allowed Price and his defenders to get a very brief breather before the Blues stormed again. With just over seven minutes to play, Hudon was called again, this time for a high stick to the face of a Blues player. This time, the Blues controlled the puck for an extensive shift in the Habs zone, but the Habs did not cave. With the Blues all over the zone, Matthew Peca held a Blues player for an obvious penalty away from the play. This time, the Blues made them pay when Alexander Steen won a puck battle behind the net and found Brayden Schenn all alone who simply the delivered the puck into the open net to tie the game with 3:16 left to play. The goal got the Habs skating again as both teams exchange some good chances. With 11 seconds left to play, Tatar intercepted an errant pass from Colton Parayko deep in the Blues territory and sent it toward the net where Brendan Gallagher got enough of it to deflect it past Allen for the winning goal with just over ten seconds remaining to secure the victory. The sample size is small, but so far Reilly is taking full advantage of the opportunities presented to him in Montreal. He is poised with the puck and making almost all the best decision to keep this same puck out of harm’s way. He started on a mission to prove that he belonged in the top-4 with Shea Weber’s absence and now he’s proving that he may belong on the top pairing once Weber returns. Stats: 1 goal, 1 assist, +1, 1 shot, 1 hit, 21:49 T.O.I. Once again, Tatar finds his name on the scoreboard. For this line, it’s more than just points though. They play the right way and that becomes contagious when the results are accompanying the work ethic. Tatar was no exception as he stood out on a few shifts from intense puck battles. Stats: 1 assist, +1, 3 shots, 14:07 T.O.I. Domi is firing on all cylinders as he’s fitting quite well in Montreal as a guy who uses his speed to create some top-notch scoring chances. On Wednesday, he used it to bury his first of what is hopefully many to come. If he can learn to use his other wing and not consistently be looking at Drouin only, he will surely pass his career-best totals this season. Stats: 1 goal, +1, 2 shots, 2 hits, 16:09 T.O.I. With 23 saves on 25 shots, this was not a performance to remember by Carey Price. What does stands out about this effort by Price is the timing of the stops he was able to make to provide confidence and energy for his team. An example of this is the slide across save made in the second period with the Blues holding the momentum after their first goal of the game. If the Blues take the lead there, this is potentially a different outcome to the game entirely. Stats: 23 saves, 25 shots, .920 sv %, 2.00 G.A.A., 59:52 T.O.I.